This dtc is output when the refrigerant pressure is either extremely low (0.19 Mpa [2.0 Kgf/cm2, 28 psi] or less) or extremely high (3.14 Mpa [32.0 Kgf/cm2, 455 psi] or more). The air conditioning pressure sensor, which is installed on the pipe of the high pressure side, detects the refrigerant pressure and sends refrigerant pressure signals to the air conditioning amplifier. 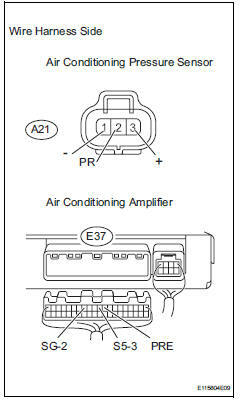 The air conditioning amplifier determines the pressure from the signals in accordance with the sensor characteristics, and controls the compressor accordingly. Check the sight glass of the cooler unit refrigerant liquid pipe. 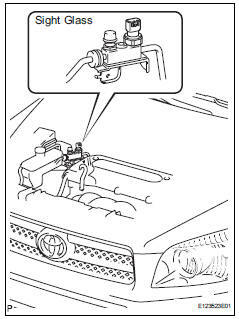 Prepare the vehicle in accordance with the chart below. 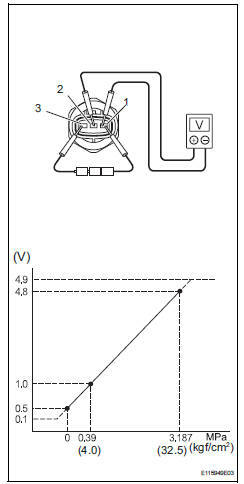 Compare the sight glass to the following chart. *: If the ambient temperature is higher than usual but cooling is sufficient, bubbles in the sight glass are permissible. Disconnect the a21 pressure sensor connector. 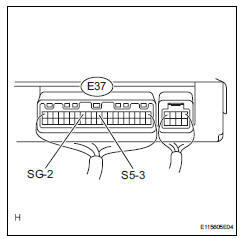 Disconnect the a21 sensor connector. Connect the three 1.5 V dry cell batteries' positive (+) lead to terminal 3 and the negative (-) lead to terminal 1. Then connect the voltmeter's positive (+) lead to terminal 2 and the negative (-) lead to terminal 1. Measure the voltage. Ok: the voltage changes in accordance with the refrigerant pressure as shown in the graph.